Sophronia’s first year at Mademoiselle Geraldines Finishing Academy for Young Ladies of Quality has certainly been rousing. For one thing, finishing school is training her to be a spy. Now, as she sneaks around the dirigible school, eavesdropping on the teachers quarters and making clandestine climbs to the ships boiler room, she learns that there may be more to a school trip to London than is at first apparent. A conspiracy is afoot, one with dire implications for both supernaturals and humans. Sophronia must rely on her training to discover who is behind the dangerous plot and survive the London Season with a full dance card. Wit, skulduggery, kidnapping, absurdity, romance, and even more of the most ridiculous British names you could ever hope to find – really what else could it be but a Gail Carriger novel? And indeed book the second in the The Finishing School series is even better than the first. Whereas Etiquette & Espionage was a wild rumpus of madcap adventure, Curtsies and Conspiracies is a story more firmly settled into its spy berth, and I very much enjoyed how this time around the story dialed back the zaniness just a notch (though delightful ridiculousness abounds, I assure you) to focus more on intrigue, subterfuge, and all around sneakery. And so Sophronia skulks and shimmies her way from drawing rooms to blimp rigging to park green, fully exercising her wits and schooling (her exploits in disguise are particularly amusing) to unravel a most nefarious plot – and while this book has everything its predecessor could boast, to me the balance just felt more right this time around. This book had everything I had rather wistfully been wishing for more of in the first book (namely more spy fun plus a bit more character meat) while still delivering a quick-paced, rousing, highly amusing adventure. In short, this was exactly the book I hoped it would be. And the thing I particularly adore about this series is how the girls are all freely allowed to be SMART. I just love how Sophronia is unapologetic about her abilities (her midterm exam is hilarious), and I love how her friends – and heck, even her enemies – are all forces to be reckoned with, each in their own way (both for good and for evil). And even better, none of these girls is perfect, none of them is infallible, all have blind spots and make mistakes and have weaknesses they have to work to overcome – even top-of-the-class Sophronia is uneasy when it comes to friendships, not to mention utterly clueless when it comes to boys – and moreover, all of the girls get to be silly, girly, petty, and even frilly at times, all without compromising their competence or brains. And so we get girls who can be both girly and not girly; girls who can both stumble and shine, girls who can miss the obvious AND outsmart and outwit their enemies – and that is truly awesome. I mean, when’s the last time you saw blatantly smart, competent AND fallible teenage girls on page or screen? Along the same lines, friends and the importance of friendship are a vital through-line to this story, as Sophronia finds herself on the outs with her particular crew, with no idea what to do about it – and then to make matters even more dicey, a bevy of desirable boys are brought onto the blimp. Thankfully however, while there was some dabbling in romantic intrigue – and yes, the specter of the dreaded love triangle does make an appearance – the crushes and feels, while amusing grace notes to the story, were never the entire point, and NEVER the central crux of the girls’ relationship woes, thankfully. Yes, there may have been an occasional swoon, but really that was beside the point – the point of the story is, friends ARE important, even to the lone-wolfishly-inclined such as Sophronia. And I love how this story quietly demonstrates how Sophronia and her particular friends make each other stronger, how their friendship makes each other better – and how each of her friends in turn gets their moment to shine. I know, take that – girls who build each other up instead of tearing each other down, and isn’t that so wonderfully refreshing? (And isn’t that a sad reflection on the state of pop culture.). But really, all in all it was just lovely to see girls who have their priorities in order – after all, boys are fun, but there is the saving of the day and each other to be gotten on with. So in the end, this book is a delightful romp, a proper blend of intrigue, mystery and adventure – with manners, reticules, and mustaches all very much in order. Oh, and did I mention the cameos? Because if you’re a long-time Carriger fan, you will be happy. Very, very happy. So bring on the next, I say! The tone that Carriger achieves is unique: the Finishing School books are both comedies of manners and high-action adventures, and are at once decorous, satirical, and often quite funny – there is a character named Lord Dingleproops, of all things. But she is also capable of taking some genuinely dark turns as the realities of adulthood start to intrude on the lives of Sophronia and her friends…Wherever Sophronia’s adventures take her next, it’s very much something to look forward to. 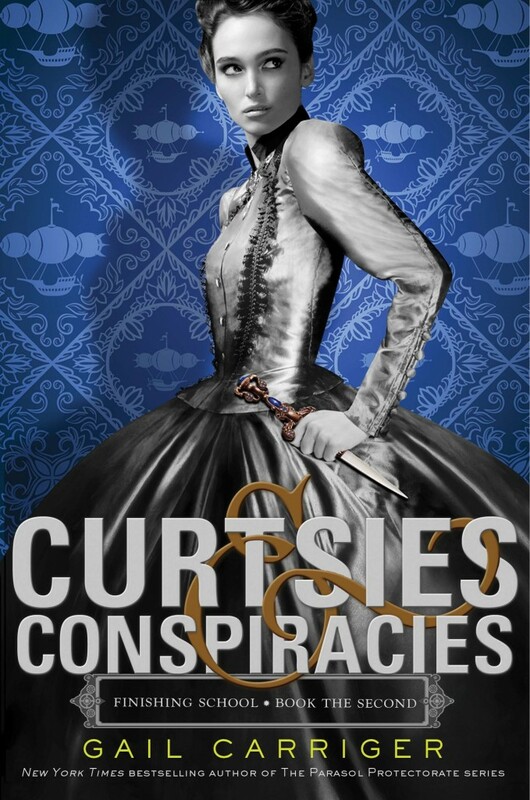 Gail Carriger has done it again with Curtsies & Conspiracies, the second book in the Finishing School series. Teenage and adult fans alike will rejoice that Carriger retains her flair for musical prose, over-the-top names (e.g. Algonquin Shrimpdittle), clever wit, and strange yet helpful mechanical devices of all kinds. Carriger’s blend of comically exaggerated characters and madcap action will easily win over readers once again.